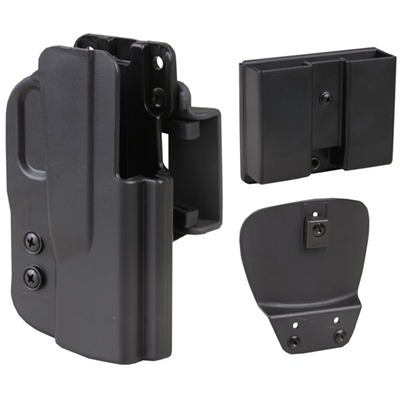 Injection molded to give an exact gun/holster fit for secure carry. A built-in sight channel and low speed-cut front provide for an ultra-fast presentation. Twin tension screws let you set precise retention force. Excellent for daily carry practice or competition. Belt – Features a straight drop belt loop with shim inserts. Paddle – Provides 3-position carry for straight drop muzzle forward or FBI cant. Delivers optimal comfort and convenience and permits easy mounting and removal from pants and belts. 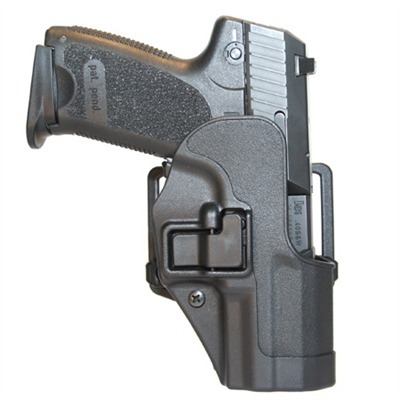 Combo Pak – Includes belt holster paddle assembly for easy conversion plus a double magazine pouch with TEK-LOK system. Mfg: Blade-Tech SPECS: Injection-molded polymer black matte. Fits 1¼"to 1¾" wide belts. Right-hand only. Belt includes shim inserts to accommodate belt width. This Blackhawk Sportster Paddle Holster with Serpa is safe and secure for your gun. with the Serpa autolock retention system in the Blackhawk Sportster Paddle Holster a swift and steady pull on the gun releases it at your command. The Blackhawk Sportster Paddle Holster with Serpa is an ideal choice for a casual concealed carry and for sporting applications. Other features of the Blackhawk Sportster Paddle Holster with Serpa include a trigger finger lock release and an adjustable tension passive retention system too. You can t go wrong with the Blackhawk Sportster Paddle Holster with Serpa. Type: Belt Holster. Hand: Right Hand. Color: Gray. Material: Carbon Fiber. Finish: Smooth. Gun Mod: Glock 19/23/32/36.